SIDNEY, Ohio — Toward the end of last summer, managers at global giant Emerson Electric Co. called an employee meeting at its air conditioning and refrigeration factory in this county seat of 21,000 people west of Dayton. They had big news: Each employee would get a $1,000 "special contribution" to a 401(k) retirement account. With the announcement, Emerson joined hundreds of companies — as many as 750 by one count — that issued similar statements to show they were sharing the wealth of a $150 billion cash windfall firms were estimated to receive in the first year from the then newly enacted tax law. On an employee bulletin board, Emerson explained in bold type that the contribution "Affirms Emerson's Core Value to Support our People and to Help Them Prepare for Retirement!" Emerson's and other companies' payments were a publicity bonanza for the Trump administration and the then-Republican-controlled Congress. Back in 2017, as the tax bill moved on the Hill, lawmakers claimed the cut they proposed in the corporate tax rate to 21 percent from 35 percent would trickle down to workers in the form of higher wages and bonuses. Emerson's action, and similar bonuses and wage increases, trumpeted by hundreds of companies like AT&T Corp. and Walmart Corp., provided proof the Republicans had their economic theory right. Or did they? For many of those same companies, a tiny fraction of the total number of U.S. businesses, executives haven't yet announced another round of bonuses or wage increases with the same fanfare — even though the tax law continues to mean billions for their bottom lines. Several advocacy groups that tracked the announcements said no new proclamations have been issued. Americans for Tax Reform, a conservative anti-tax group run by Grover Norquist which boasted last year of ongoing "good news" in bonuses and benefit increases, hasn't reported any announcement for three months. Americans for Tax Reform didn't respond to requests for comment. Most American businesses that announced bonuses and wage increases seem to be more like Emerson, which has "no plans to make an additional 401(k) contribution this year," a company spokeswoman said. That's what has made the promise of higher compensation so far elusive. The Bureau of Labor Statistics reported nominal wages increased 3.2 percent in January year over year, and by less than one percent — three cents to $27.56 — month over month. While some economists have voiced enthusiasm about the improvement, other economists note that wages must grow for a sustained period to offset decades of stagnation. "The problem has not been solved," said Seth Harris, deputy secretary of the Labor Department in the Obama administration. The increase was "imperceptible," Mishel wrote in December on EPI's blog. "Whatever growth in bonuses has taken place is not necessarily attributable to the tax cuts, rather than employer efforts to recruit workers in a continued low unemployment environment." Back at Emerson, as managers unveiled the news at the Sidney plant, longtime employee Lerouise Rupert, 32, said she was excited at first. "I'm thinking, 'This is going to be good.' They told us, 'We're going to give you a $1,000 bonus,'" Rupert said recently while sitting with her three children in a nearby Wendy's restaurant. Then Emerson managers explained the details. 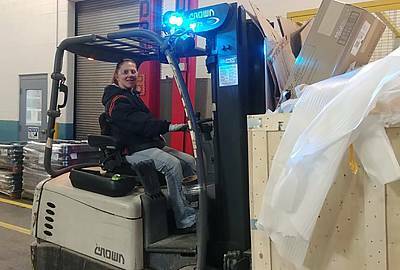 The bonus wasn't being awarded in cash because "'it would get taxed a lot," recalled Rupert, whose job runs from driving a forklift and loading the assembly line to building electrical boxes. So instead, they said, "We're going to put it in a 401(k) for you.'" The contribution has had little tangible benefit for Rupert, who has a company pension but did not have a 401(k) account at the time, and for many of her co-workers. Their real need is for money immediately to pay bills, or in Rupert's case at the time, the chance to buy presents for her children instead of signing up for a local charity gift program. "I was looking forward to this check for Christmas," she said. Rupert's experience provides a stark contrast to how Trump and Republican lawmakers sold the tax law. "You're going to start seeing a lot more money in your paycheck," Trump said a year ago at an event in Nashville, Tennessee. A couple months earlier, Trump, and then-House Speaker Rep. Paul Ryan, R-Wis., boasted the tax law would likely give typical households a $4,000 a year wage hike, with the White House reporting wages could even increase by more than $9,000 a year. Last May, five months into the new law, Farr told Congress, "Tax reform is helping strengthen communities, build new career opportunities and increase paychecks for the men and women of America's manufacturing workforce." Emerson's tax rate fell to 17 percent in 2018, according to its annual filing with the Securities and Exchange Commission, and company executives estimate a rate of 24 to 25 percent this year, boosting profits. Farr told investors in an August presentation that the tax law allowed the company to increase wages and improve the company's health plan, parental leave and paid time off. And for those on the ground, Emerson's largesse appears limited. That's what employees say at Ridge Tools, an Emerson subsidiary in Elyria, outside Cleveland. 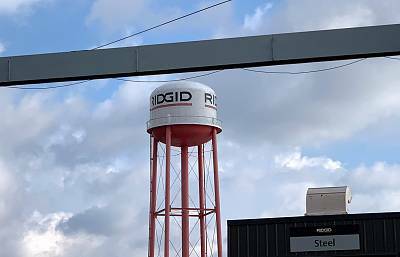 The company has a commanding presence in the struggling town of 54,000, with its own water tower emblazoned with the word "Ridgid," the brand name of the power tools the company makes. Several Ridge Tool employees, who asked to remain anonymous, told the Center the corporate tax cuts have not increased their salaries. They have received the same annual increase in their wages as in past years: less than 3 percent. Emerson recently increased the vacation time to three weeks from two weeks for employees who have been employed for at least five years, they said. 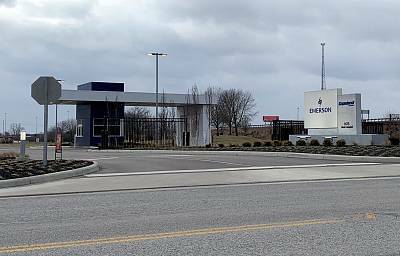 Hourly wages at Emerson's Sidney plant that make Copeland Scroll branded products increase by 3 percent a year under the union contract. An Emerson spokeswoman said the company is spending $3 million annually on improved benefits but declined to provide details. The spokeswoman said the company provides "market-based pay increases." Ridge Tool workers also received that $1,000 retirement contribution, and not all were disappointed. Joe Neudenbach, a longtime employee, said he had planned to withdraw the money immediately — at 61 years old he can without paying a penalty — to buy a new recliner to watch the Super Bowl. "The $1,000 was cool. I didn't see it coming," said Neudenbach. Still, the one-time bonuses and one-time 401(k) contributions have been widely panned as public relations stunts that are not financially sustaining like annual wage increases. Longtime pensions and retirement expert J. Mark Iwry said, "It would seem appropriate for employers to share their tax savings with their workers." Some claim the Tax Cuts and Jobs Act was indeed a windfall for employees in 2018. The conservative Americans for Tax Reform group kept a running tally of corporate announcements through last October and listed as many as 750 examples.pdf) of "pay raises, charitable donations, special bonuses, 401(k) match hikes, business expansions, benefit increases, and utility rate reductions attributed to the Tax Cuts and Jobs Act." Another report by the nonprofit Just Capital, which tracks the Russell 1000 Index, which includes the largest U.S. public companies, found that 145 companies in the index announced plans for spending the cash windfall, and only 6 percent of spending was allocated to workers, "more than half of which takes the form of one-time bonuses, as opposed to permanent raises or benefits." Among the first companies to come out with announcements of bonuses and pay raises because of the tax law were Walmart and AT&T. On Jan. 11, 2018, Walmart announced it was giving out $1,000 one-time bonuses to eligible employees and increasing starting hourly wage to $11 an hour. The same day, Walmart filed notices to lay off thousands of workers. A Walmart spokesman said the company has no current plans for a 2019 company-wide bonus. He said the hourly employees' average total compensation and benefits is more than $17.50 an hour. By this time last year, a number of companies including The Walt Disney Co. and Southwest Airlines had announced they would use a portion of the tax windfall to give one-time employee bonuses. Southwest said it would use $55 million of its $1.3 billion tax windfall on bonuses. At the same time, it spent $2 billion on buybacks in 2018. Disney received a $1.7 billion benefit and paid out $125 million on employee bonuses — and $3.6 billion on share repurchases. None of the companies have announced another round of bonuses. Southwest said it had no plans to give bonuses this year and Lowe's did not respond to requests for comment. Disney referred the Center to its January 2018 announcement. To have the tax cuts translate into increased wages, the theory goes, several factors need to align. Republicans and corporations argued the tax cuts would lead to increased investment in factories and machinery. That would create more productive and valuable workers, which "would bid up the wages," said Mark Mazur, head of the nonpartisan Tax Policy Center in Washington. But for that to happen, "every linkage has to work," he said. Meanwhile, in Sidney, Rupert is still trying to cash out her $1,000 retirement contribution, which was the only deposit in her 401(k) account because she didn't have one when Emerson gave out the bonuses last year. Rupert said she is willing to pay the penalty for an early withdrawal but she hasn't gotten far with her inquiries.